SALONIKI, Aug. 19 - There has been a romantic sequel to the political murder in Constantinople of Zeki Bey, editor of an opposition paper. The day after her father's assassination Zeki Bey's daughter eloped with a Greek who was a neighbor of the family. The closed secrecy was necessary, as the idea of a union between a Mohammedan girl and a Christian rouses the Turks to frenzy and would probably be punished with death. From Constantinople the pair went by steamer to Pireaus, the port of Athens. Here the Turkish consul boarded the steamer to arrest the girl. The Greek harbor officials questioned his authority and the lovers hastened ashore to a hotel, where a policeman was detailed to guard them from further molestation. New Jersey World War I Draft Registration Cards, for men citing birth in Greece, are available FREE through the FamilySearch.org website. 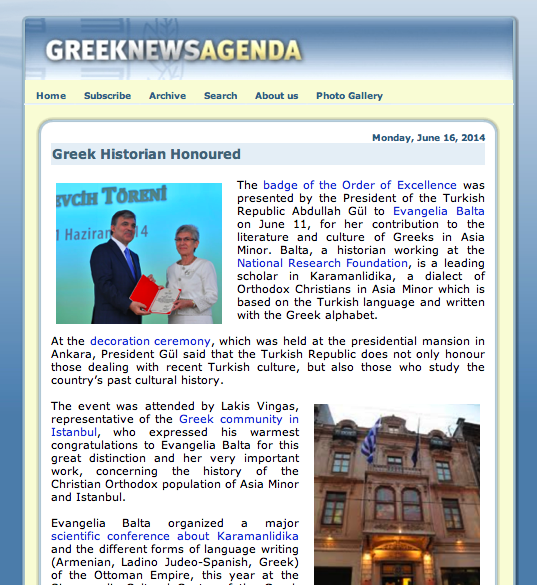 The badge of the Order of Excellence was presented by the President of the Turkish Republic Abdullah Gul to Evangelia Balta on June 11, for her contribution to the literature and culture of Greeks in Asia Minor. 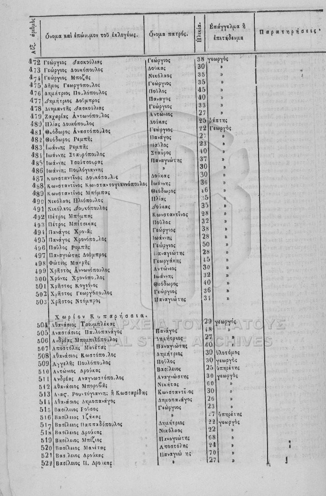 Balta, a historian working at the National Research Foundation, is a leading scholar in Karamanlidka, a dialect of Orthodox Christians in Asia Minor which is based on the Turkish language and written with the Greek alphabet. The Greeks of Cairo is a photo exhibition by Paul Kozalidis and Athena Casole. . . . and is currently on display at the Museum of Modern Art Mahmoud Mukhtar. . . 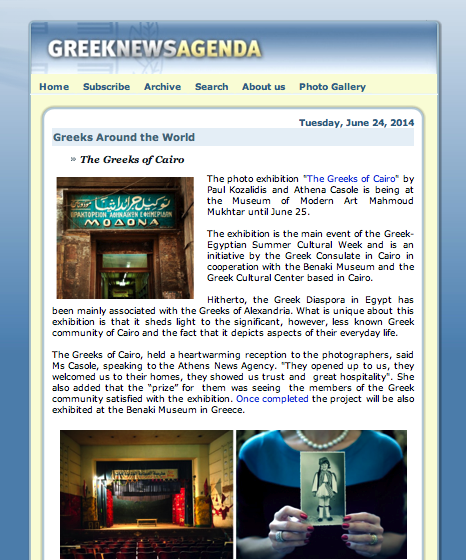 The exhibition is the main event of the Greek-Egyptian Summer Cultural Week and is an initiative by the Greek Consulate in Cairo in cooperation with the Benaki Museum and the Greek Cultural Center based in Cairo. Hitherto, the Greek Diaspora in Egypt has been mainly associated with the Greeks of Alexandria. What is unique about this exhibition is that it sheds light to the significant, however, less known Greek community of Cairo and the fact that it depicts aspects of their everyday life. . . . . The project will also be exhibited at the Benaki Museum in Greece. 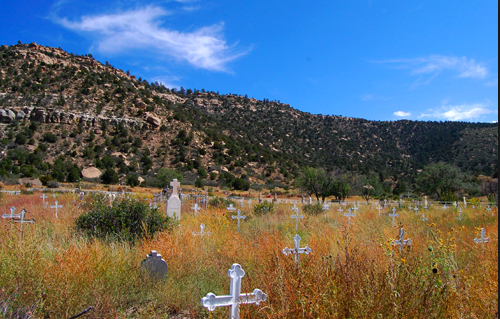 On October 22, 1913, the mines in Dawson, New Mexico suffered their first major disaster. Stag Canyon Mine No. 2 was shaken by an explosion that was felt two miles away in the town proper. Relief teams rushed in from surrounding communities, but of the 286 men who arrived to work in the Stag Canyon mine that morning, only 23 survived. 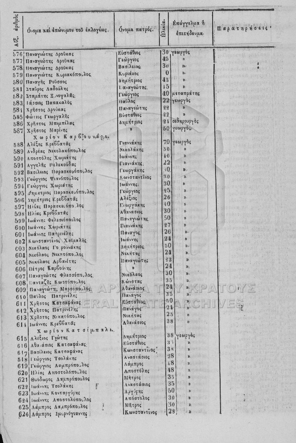 Of the worker casualties, 146 were Italian and 36 were Greek. Two rescuers died during the rescue effort. It was later determined that the explosion was caused by a dynamite charge set off while the mine was in general operation, igniting coal dust in the mine. This was in violation of mining safety laws. The other mines remained productive after the disaster in Mine No. 2. Then, on February 8, 1923, Stag Canyon Mine No. 1 suffered an explosion. A mine car derailed, igniting coal dust in the mine. 123 men were killed in this explosion, many of them children of the men who died in 1913.